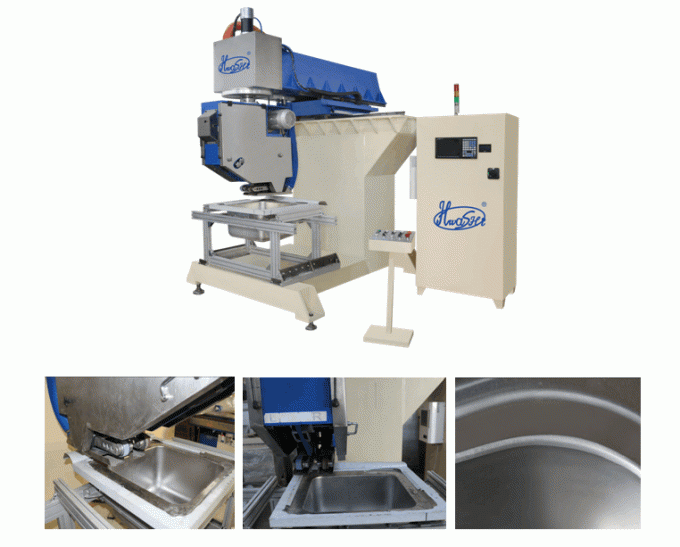 This CNC sink grinding special machine utilizes abrasive belt polishing principle. The abrasive belt is driven by electric motor to conduct polishing on the edge of the welded sink. There are two processes for polishing. Firstly, use the coarse abrasive belt to grind the redundant cutting edge and the projection welding spots. Then use the fine abrasive belt to conduct polishing treatment. After these two processes can meet the requirement of sink grinding and polishing treatment. It is designed to use Mitsubishi professional automatic control system. You only need to input the coordinate data of the product and start the machine, the abrasive belt of the machine will conduct grinding and polishing automatically within the track of preset program. The worker only needs to put and take out the sink. The product will be fixed on the locating mould. The servo motor will drive the X and Y axle to run within the preset data of program. The machine could store 15 types of grinding models. The grinding wheel will move along with X direction and the max moving range is 1220mm while the max moving range of Y direction is 620mm. The Z axle can conduct moving up and down within the range of max 250mm while the A axle can conduct 360ºrotating under the control of servo motor. 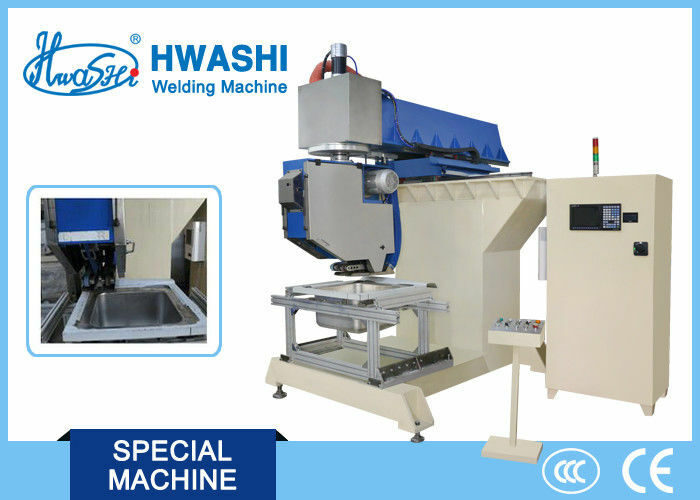 This machine is suitable for different directions of product. 1. Main Body:Adopt the reinforced special designed steel, vertical structure as the body. Enough strength and stability. It is equipped with slideway and servo motor drive system. 2. Control System: Adopt Mitsubishi professional control system and touch screen as the human-machine interface with clear English input. The PLC, as the control hub as the whole machine, is in charge of reading, transmitting and controlling all kinds of signal processing and coordinating with various external instructing transmission signal mechanism in order to ensure the validity of all orders of execution of the machine. The self-detection of all automatic testing stations effectively eradicates the occurrence of malfunction and other accidents. When the pressure, current, air pressure, hydraulic pressure, temperature or other testing signals are in abnormal situation, the machine will give an alarm to prevent any insecure accidents. 3. CNC Mobile System:This proposal adopts coding servo motor. The moving range is 1200mmx600mmx230mm. It is equipped with finish machining good quality slideway, screw ball and automatic dectection system with quick response and high control precision. This automatic device is designed with four axles structure (X, Y ,Z , A axle). Use the PLC to store setting mobile program. Simple and convenient setting. 4. Rotating System: Adopt large power servo motor as the driving source which can complete 360º rotation. Powerful source, simple and convenient adjustment. 5. Grinding System: It is designed with two abrasive belt devices. One set is coarse abrasive belt, another is fine abrasive belt. The electric motor drive the abrasive belt to conduct high speed rotation. The abrasive belt is equipped with tensioning wheel and driving wheel. It is suitable for grinding of different work pieces. Simple and convenient replacement. 6. Whole Machine Structure: Convenient electrode disassembly, installation, and maintenance of the whole machine; Clear color mark and neat wiring of electric circuit, gas circuit, water circuit. 1. Adopt silicon controlled from IXYS of United Stated with high precision and long service life. 2. Adopt integrated circuit from Motorola of U.S. and PLC from Japan SIEMENS with quick response and stable performance. 3. Adopt Japan Panasonic intelligent touch screen control system which is installed with automatic bug alarm system. Clear interface, easy operation, and stable performance. 5. Adopt Taiwan TECO servo motor with powerful strength, high precision and stable control. 6. Adopt South Korea SANWO pneumatic components with stable performance. 9. Strictly comply with CE security standard to design the machine. Lower the accident rate. Over 20 years of experience in wire mesh industry and export more than 50 countries. Hwashi is the real professional manufacture. The quality of products is the key of enterprise survival. Hwashi is ISO9001:2000 certificated manufacture. We’ll exact control each producing process to reduce cost for our customers. After clients receive the quotation, we’ll show you the rationality of the price and the difference between our products and other supplier’s products. The customer’s need is delivery on time, rather an excuse. We’ll make a production plan before producing, and the sales will regularly inform the production schedule and process to the customers. English is the basic and other languages can be understood. All customers’ e-mail will be replied within 2 hours at working hours and must be replied within 12 hours at non-working hours. Personalized, professional service: we can provide different programs according to customers’ requirement, thus make customers choose the best and most appropriate one. 24 hours technical support by email. Our professional team is always here willing to be your technical consultant.